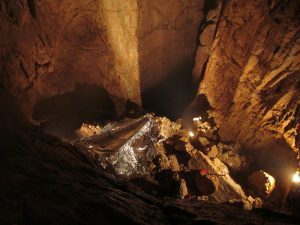 YUCPC’s deepest find in Durmitor, Bunda Jama, had been pushed in 2014 to a large sump pool dubbed The Blue Lagoon, marking the start of a flooded passage. This pool lay 622 m below the surface of the mountain range, making Bunda Jama the second deepest cave in the area, and the fourth deepest in the country. We were really keen for the sump to be dived and pleasingly Tony Seddon, an experienced cave diver who had joined us on our 2013 expedition, seemed equally keen when he heard our stories and saw our photos. In addition to supporting the diving, a small group had time to visit the Tara canyon where some of the water that lands on the Durmitor plateau some 1500 m higher up is known to resurge. 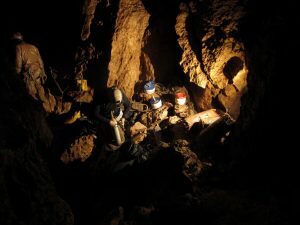 For a mixture of reasons, several of the familiar faces on our previous expeditions to Montenegro couldn’t join us in 2016, but we mustered a small team comprising 12 cavers of varied age and experience, ranging from undergraduates on their first expedition to seasoned expedition veterans who had been exploring caves across the world for decades. 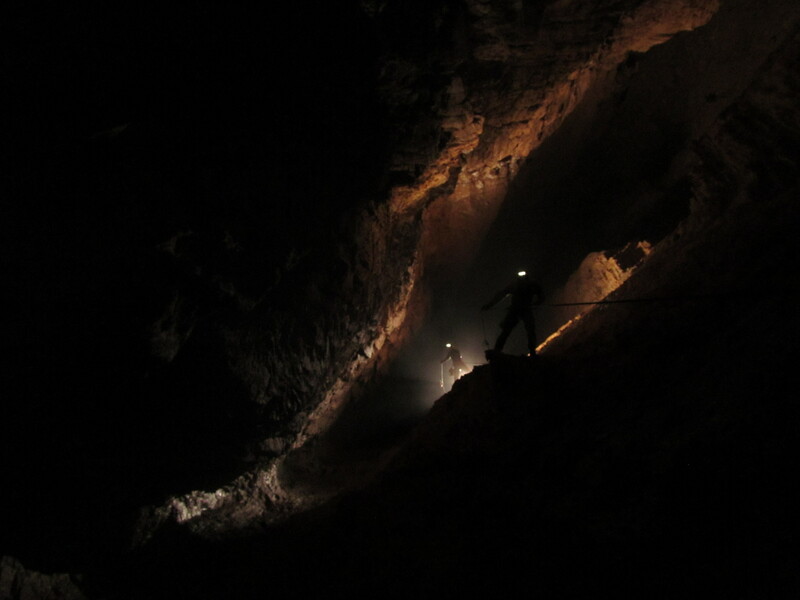 Unlike our previous expeditions when we had been exploring unknown new dry passages, this year we knew how many carabiners, metres of rope, tackle bags etc. we needed, but unlike previous years we had the not-insignificant addition of a full set of diving gear to take with us. For just 12 people, the quantity of kit we needed to carry up and down the mountain was pretty significant to say the least, and the 4-5 hour steep uphill walk became all too familiar to all of the team over the two weeks we were camped on the mountain. Frustratingly the first week brought us bad weather, peaking with a huge storm that hit when a small team were carrying yet another load of equipment up the hill to camp. The collection of 150 l of rainwater at camp from just one tarpaulin gives some of an idea of the severity of this weather. As well as providing some unpleasantness, the weather also forced us to postpone our caving trips because we couldn’t sensibly navigate the hour or so walk from camp to the Bunda Jama entrance in the thick cloud. Thankfully after a few days the weather eased and we got underground, some of us very familiar with the cave, and some experiencing the cave for the first time. We were surprised to find this year that there was snow and ice more than 100 m below the entrance. Rigging the cave went fairly smoothly, and despite a drill malfunction and a few anchor issues we had rigged all the way to The Blue Lagoon in 5 days. One of our fairly significant challenges for 2016 was that diving necessitated an underground camp site to be constructed. In many caves this would not be a large challenge, but Bunda Jama seems to be a particularly hostile cave in this respect: it retains a steady temperature close to 0 °C, is largely vertical in nature, and it is rare to be able to escape the flowing water. That’s not to mention a lack of flat areas on which one might want to sleep. We had earmarked a relatively dry muddy area at –600 m for our camp, based on a combination of hazy memories. This site was far from ideal, but the best we could find. It was a roughly 5 m x 5 m sloping ledge situated between two vertical drops, adjacent to a large (10–20 m) waterfall. After a large amount of boulder-moving and mud-shovelling we made the area acceptably flat. Unfortunately, after making it flat, the mud liquefied and we were left with a bit of a dilemma. We decided to put up the shelter as if everything had gone to plan, and thankfully the mud (just!) solidified sufficiently for the camp to provide enough comfort to be able to get a night’s sleep. Meanwhile, the group at the Tara canyon had finished their trip down the river, having logged several sites of interest including several areas where water was resurging from the side of the canyon and a large cave with a (presumed) un-dived crystal clear sump. These finds certainly provided food for thought regarding any future trips to the area, but a more immediate task was to ead up to re-join the team on the mountain. A team of 6 took all the gear needed for the planned dive and camp and Tony then kitted up and set off into The Blue Lagoon. The pool itself turned out to be around 35 m long, and at around this point the floor dropped away to an unknown depth. After a further 15 m of progress the floor had dropped away out of sight in a passage around 3–4 m wide, and continued like this for another 30 m. Unfortunately by this time Tony was 31.3 m below the surface of the sump, marking the safe depth limit for the equipment he was using. Some of the team had waited at the camp for his return, so on hearing the news they headed out, starting the big job of getting all the gear back to the surface while Tony settled in for a well-earned rest at camp. The derig was carried out remarkably quickly, and all the kit was removed from the cave within the following four days without incident. Although we’d have preferred the sump to have been a small one leading to more dry passage beyond, we were all extremely satisfied with the result. 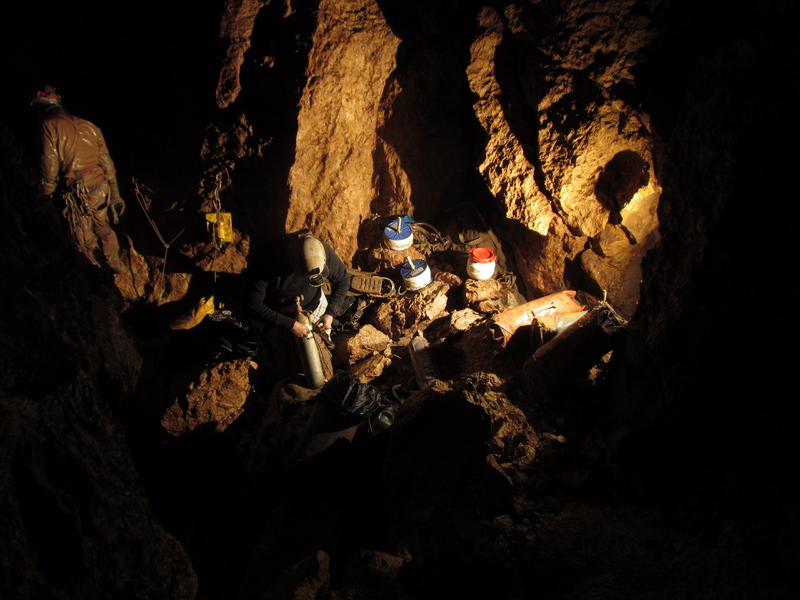 We had facilitated the first ever cave dive in Durmitor, making Bunda Jama around 650 m deep (currently awaiting an accurate value). Many questions about the hydrology of Durmitor remain, but no doubt more answers will be found on future trips to the area.